I own several species of reptiles ranging from bearded dragons to Argentine black and white tegu. 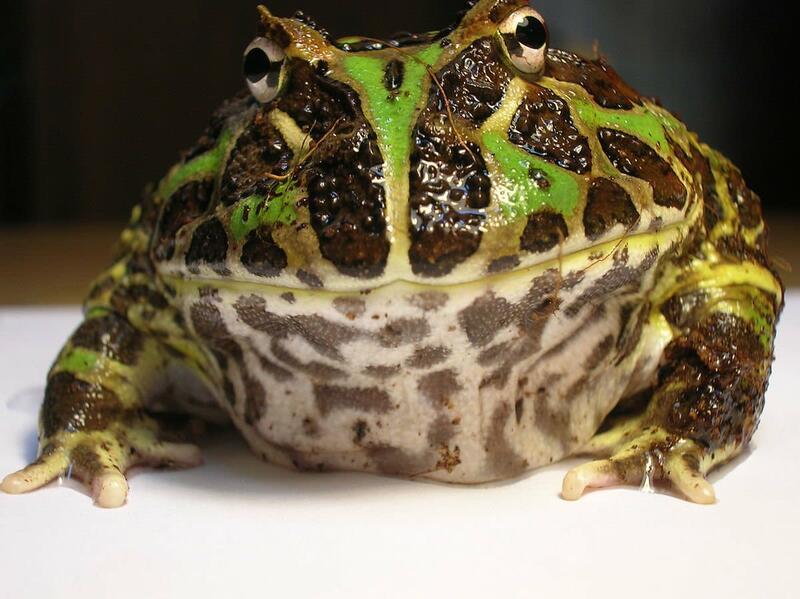 Pacman frogs have become a common pet in the reptile/amphibian community. 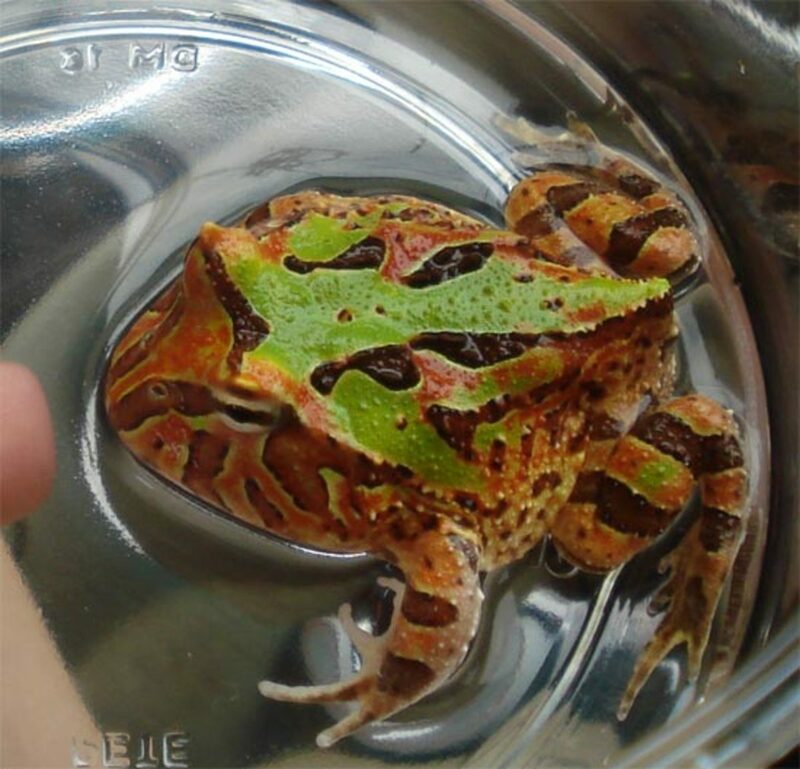 There are several different "morphs" of Pacman frogs, such as the green, albino, strawberry, and brown variant of the Pacman. They have a voracious appetite and get quite large. Due to their exceptional size, their popularity has increased. 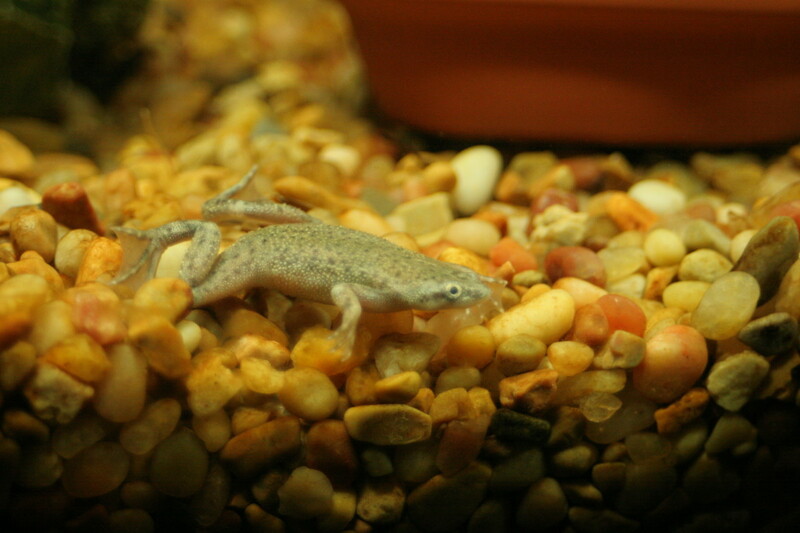 Pacman frogs can get up to 6.5" in circumference, and females are typically larger than males. Ideal temperatures for daytime should be in the range of 74 degrees Fahrenheit to 82 degrees Fahrenheit. If a Pacman frog is burrowing itself in the substrate relatively deep, it may be trying to avoid the heat or the cold. You will have to adjust your temperatures until your frog is comfortable. Most often frogs tend to like temperatures between 76 degrees Fahrenheit and 80 degrees Fahrenheit. A UTH (under tank heater) may be used for heat on one end of the enclosure. *Note* The UTH should be placed on the SIDE of the enclosure and not the bottom. Night temperatures should be no lower than 73 degrees Fahrenheit. 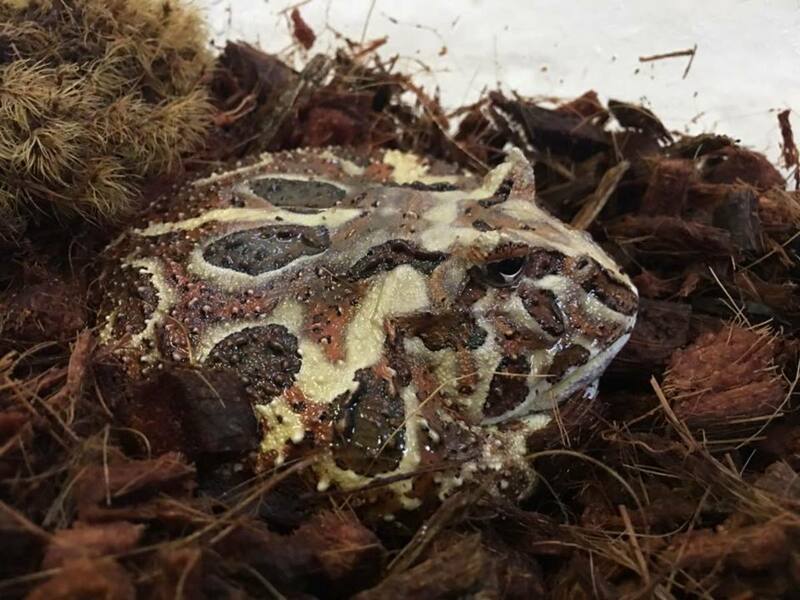 If you notice your frog burrowing deep, sleeping for long periods of time, or starting to have skin that looks dry and shell-like, your frog is going into estivation (like hibernation), and you should adjust your temperature and humidity to stop this. Humidity should be kept between 60% and 80%. 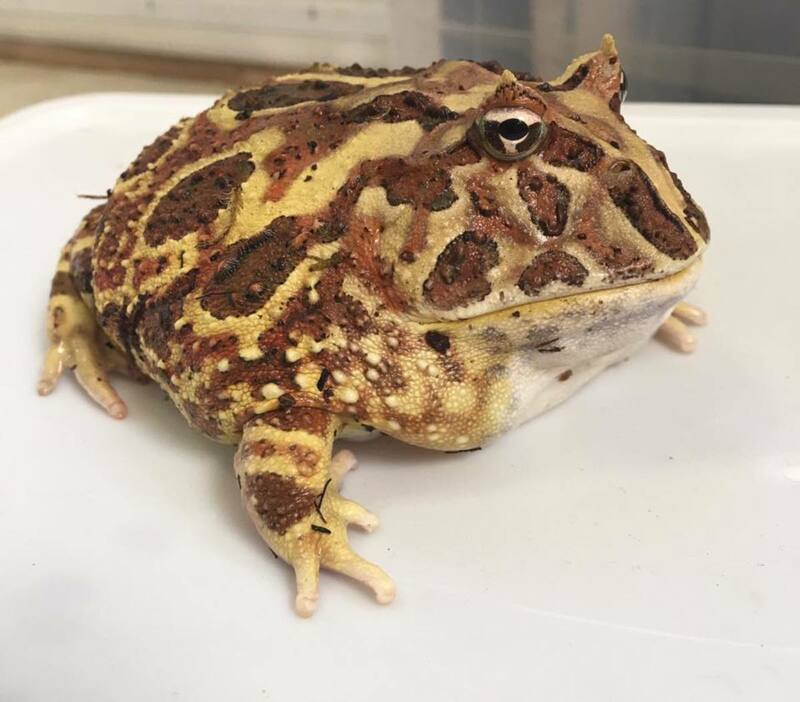 Pacman frogs do well on a diet consisting of a variety of vitamin/calcium dusted insects such as crickets, roaches, earthworms, and hornworms. There are also quite a few commercial brand Pacman frog foods that state they are a complete diet for Pacman Frogs. These can be found on Amazon or in your local pet store. As Pacman frogs grow, the introduction to pinkie mice and fuzzy mice can begin. 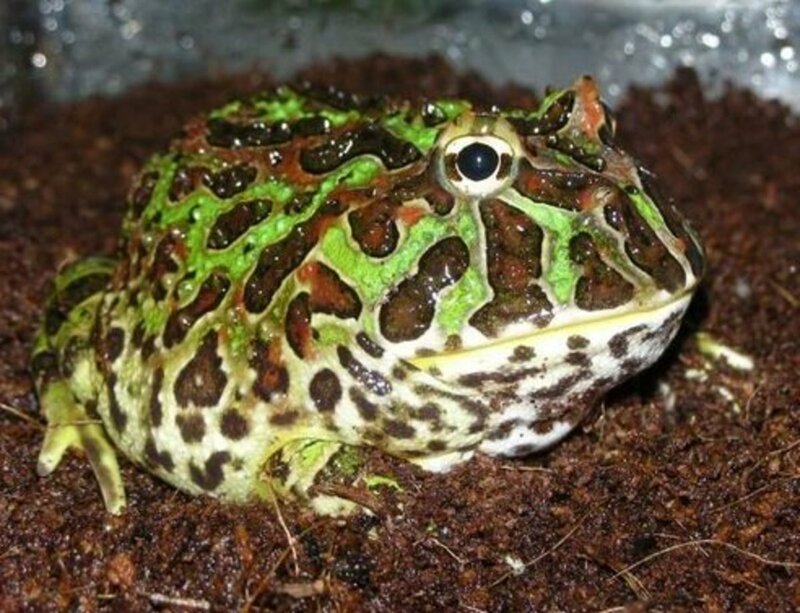 Only feed your Pacman frog pinkies or fuzzies once a month. Adults should be fed about two to three times a week, and juvenile Pacmans should be offered food on a daily basis to help them grow and thrive. They may or may not eat daily, it depends on the food size and type offered and the frog's appetite. Pacman Frogs are NOT aquatic frogs and they will drown if kept in water only. Water dishes should be large so the frog can get into it and soak, however, it should be shallow enough to where the water does not go past the frog's chin. Calcium with D3 should be provided twice a week. 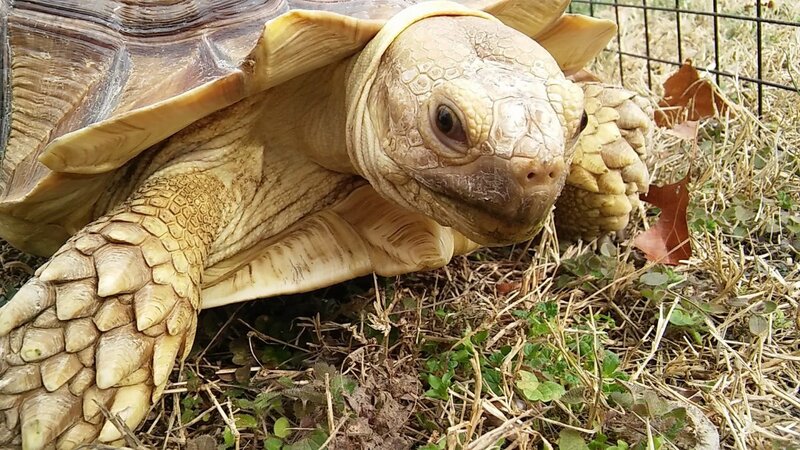 Reptile vitamins should be provided once a week. Food items should be dusted lightly with supplements, this makes sure that the frog gets the needed nutrients and minerals that are required to grow and thrive as a healthy Pacman frog. Supplements such as calcium with D3 (twice a week) & reptile/amphibian vitamins (once a week) should be used. Food items should be dusted lightly with these supplements. This will ensure the frogs get the nutrients and minerals they need to grow & thrive as healthy frogs. Pacman frogs are SOLITARY animals. Cannibalism is common among Pacman frogs so they should always be kept to one frog per enclosure. A five to ten-gallon aquarium is perfect for a Pacman frog to live in. 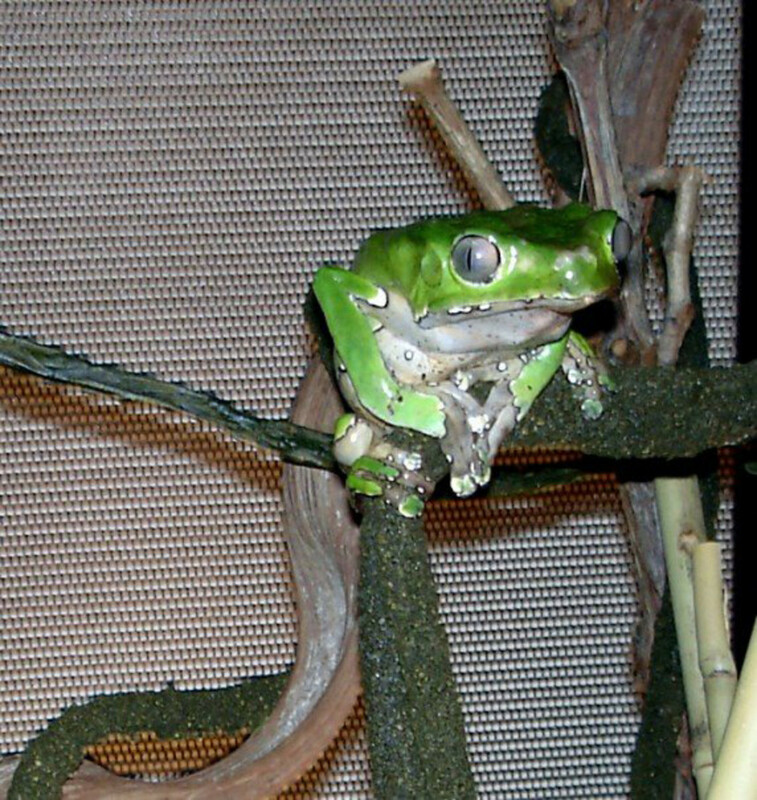 These frogs do not move all that much and do not require a large enclosure. Alternatively, storage totes can be used as an enclosure. A water dish large enough for the frog to sit in for soaking. The commonly preferred substrate for these frogs are coco-coir or Bed-a-Beast (coco fiber) moistened. 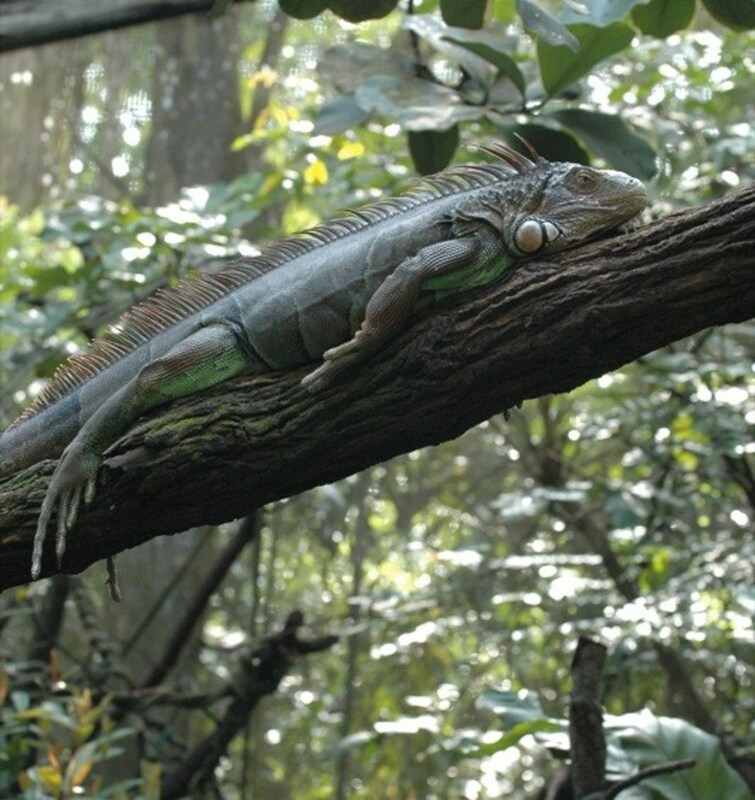 Fresh, clean water should always be available as well as daily misting of the enclosure. Live plants can be used in Pacman frog enclosures to help with maintaining humidity, however, Pacman frogs dig into their substrate which could lead to uprooting plants. Pothos plants are a great plant for a Pacman frog enclosure as they can withstand moist environments. 2" to 3" is the minimum depth recommended for horned frog terrariums to maintain proper humidity levels. The substrate should be kept moist, not muddy or swamp-like. Spot clean as needed and clean completely at least every month while checking daily for any mold or other growths within the substrate. Pacman frogs are a great pet for anyone to keep. They are a beginner level pet and do well when provided with adequate husbandry. This is just a basic summary of the care Pacman frogs require. 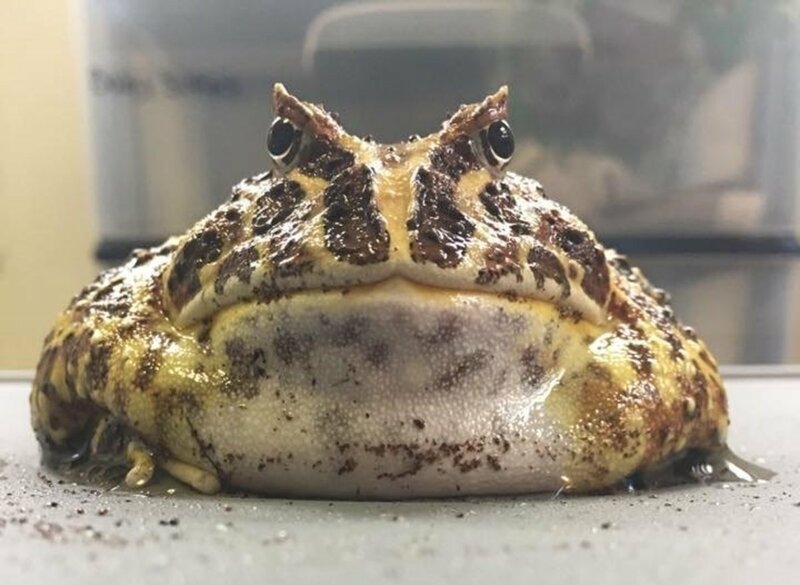 It is strongly suggested that potential Pacman frog owners do as much research as possible on the species before acquiring them, just like any animal. I would love to have one as a pet, I am ill and had to rehome my 2 cats.